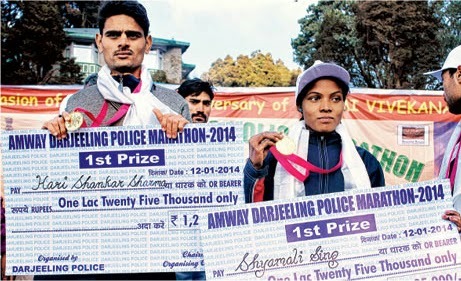 Darjeeling district police will organise a 21km-long half marathon to mark the birth anniversary of Swami Vivekananda on January 12, an event which is likely to see the participation of international runners. Amit P. Javalgi, the superintendent of police, Darjeeling, said here today that the main objective of organising the event was to promote tourism in the Darjeeling hills. "We would like to impart a message that Darjeeling is the place where peace and harmony prevail." He said former Indian athlete Shiny Wilson would inaugurate the half-marathon at Sukhiapokhri. According to him, around 1,000 people had participated in the race last year. This year, the organisers are expecting a higher turnout. "Registration for participating in the race has started and will continue till January 11. The registration fee is Rs 250. However, on January 12, we will allow any sports enthusiast to take part in the run without registration. Prizes will be given only to those who register their names," said Javalgi. 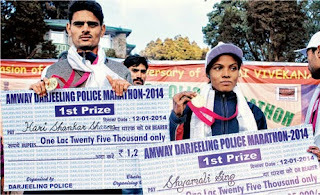 Ahead of the Darjeeling run, another half-marathon will be held in Siliguri on January 10 as part of the ongoing Uttarbanga Utsav. The Siliguri Marathon will be organised jointly by the north Bengal development department and Agrani Sangha, a local club. The 21-km long run will be flagged off from Hashmi Chowk and end at the Agrani Sangha club.